Text extracted from ‘Engineering in Hong Kong-50 years of Achievements’ published 1997. Many thanks to IDJ for sending this. The EPD first drew up plans for the development of a network of refuse transfer stations and three strategic landfills in the late 1980s. In order to tap private sector expertise in waste management, the department pioneered the adopting of the build-operate-transfer (BOT) concept on these projects. This concept tends to encourage the adoption of innovative solutions, and these were amply demonstrated by the design and construction of Island West refuse transfer station. Island West was the first refuse transfer station to be housed in an underground cavern, a location which avoids visual intrusion while providing for the containment of noise and odour. Private initiative came into play when the development team came up with an alternative design which slashed the capital cost of the project by one-third, firstly by reducing land-take by the adoption of a spiral rather than extended ramp to site level; and secondly by altering the original layout. The partners rearranged the underground facilities in such a way that it was able to off-set the two floors–the tipping hall, and the compacter room–to achieve a dramatically smaller volume of excavation. This design saved 30% of excavation, which translated into financial benefits to the tune of HK$363 million: the capital works cost just HK$637 million instead of the HK$1 billion estimated originally. With the EPD taking on monitoring role to ensure that the new generation of waste handling facilities were environmentally friendly in every way, the refuse transfer stations were designed, constructed and are operated to the strictest environmental criteria. Island West, for instance, comes complete with an integrated sewage treatment plant and odour control equipment inside the cavern. Extensive air handling systems ensure adequate circulation as well as dust and odour treatment. Indeed, all refuse transfer stations are carefully designed structures featuring advanced pollution control systems. 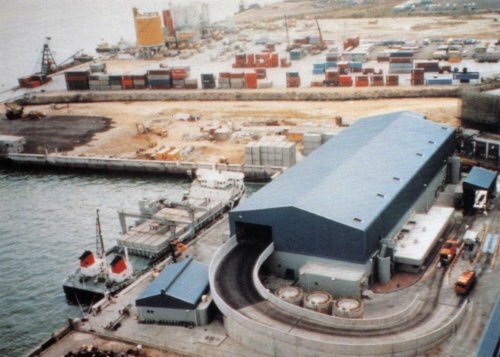 For example, the Kowloon Bay refuse transfer station, the first refuse transfer facility to be commissioned, was laid out in such a way as to minimise the impact of noise on a nearby temporary housing area. Odour is removed by odour control units which employ activated carbon and potassium permanganate to absorb and oxidise odorous gases while dust is removed from the air by filtration units. In addition, push-pits are fitted with misting sprays to suppress dust. Some refuse transfer stations now use a new, more efficient system of compaction involving “walking” floors. By using moving slats at the bottom to direct refuse into a compactor’s charge box, this system reduces the idling time associated with push-pits using traversing ram blades. Many refuse transfer stations also employ pre-compaction to achieve a more uniform compacted refuse density than direct compaction. The refuse transfer stations are designed to collect solid waste for disposal at three strategic landfills which together have a design capacity of 135 million cubic metres of solid waste. The largest of the three, WENT (West New Territories landfill), has a design capacity of 61 million cubic metres, compared with a meagre 0.03 million cubic metres of waste at one of the smallest landfills which are now the subject of restoration. For the development of these strategic landfills, engineers were not only involved in the design and construction, but also in the formulation of the contract terms, which require the developers to be responsible for each landfill’s restoration as well as aftercare for 30 years after cessation of operation, to guarantee that these landfills would not cause the same environmental problems associated with the old landfills. Privatisation has once again resulted in the development of three quality engineering works of the highest environmental standards. WENT occupies a 106-hectare site in Tuen Mun and was installed with a sophisticated lining system to prevent groundwater contamination. It is installed with a two-millimetre high density polyethylene liner and a six-millimetre bentonite matting with a system to detect leachate, a fluid by-product of landfills. Leachate is collected and pre-treated prior to discharge into a sewage treatment works for further treatment while landfill gas is extracted for flaring and utilisation by on-site plant and equipment. NENT (North East New Territories landfill), which was developed in four phases over ten years, is lined with a sophisticated seven-layer liner system which includes several layers of non-woven geotextiles. As a further safeguard against pollution of underground water, 30 monitoring boreholes varying in depth from 70 metres to 150 metres are set up around the site perimeter to monitor the quality of underground water. Special boreholes are also installed to pump escaped leachate and bring it back to the system. The landfill is equipped to utilise the 2,000 kW of power expected to be produced by landfill gas, most of it between the fifth and tenth years of operation. SENT (South East New Territories landfill) has a designed capacity of 39 million tonnes. Located on a 100-hectare site in Tseung Kwan O, on partly reclaimed land, the landfill can be filled to a maximum depth of 100 metres. These three strategic landfills are located in remote parts of the New Territories and carefully sited to avoid visual intrusion. As for the old landfills which for years were an eyesore and a public health risk, engineers are working towards their restoration and transformation into functional public spaces equal in total size to 300 football pitches. Liquid waste disposal: The management of liquid waste disposal is just as important, if not more so, than that of solid waste, if for no other reason than the fact that water is such a dominant and visible element in Hong Kong. Is Hong Kong “Fragrant Harbour” or “Flagrant Harbour”? It is a question many might well have asked when confronted with the stink, generated by 1.5 million cubic metres of untreated sewage, which not so long ago greeted every nostril within sniffing distance of Victoria Harbour. The EPD has put much effort into improving water quality, on one hand designating water control zones, on the other implementing comprehensive sewerage masterplans. Today, Hong Kong has one of Southeast Asia’s finest sewerage networks. Water quality in Victoria Harbour continues to improve and, rather than red tides, people are enjoying clear blue water in which to take a summer dip at beaches. But for some ingenious engineering, those same beaches might have been forced to close eventually due to the health risk they posed. The southern part of Hong Kong Island, where the most popular beaches are located, used to have two sewage-related problems: an old and inadequate sewerage system; and private property owners who did not always discharge their duties in terms of sewage treatment. The Island South Sewerage Scheme solved both problems. The scheme divides Southern District into three areas. The first area is Shek 0, which is covered by a modest system consisting of 1 kilometre of pumping mains, 1 kilometre of sewers, a pumping station and a screening plant. The second area groups Repulse Bay, Deep Water Bay, Shouson Hill, South Bay and Middle Bay under a system consisting of six kilometres of pumping mains, six kilometres of sewers, four subsidiary pumping stations and one main pumping station which pumps sewage to a treatment facility in Aberdeen. The third area, covering Red Hill, Ma Hang, Chung Hom Kok and Stanley, is served by four kilometres of pumping mains, six kilometres of sewers, ten pumping stations and an underground treatment works in Stanley. Island West refuse transfer station is not the only environmental project to be housed inside a rock cavern; the first one was the Stanley underground sewage treatment works. Due to the location of the works in a scenic area, engineers initially considered siting it on a reclamation in Tweed Bay, where a ridge would shield it from view. However, crossing the ridge in order to build the plant would have been difficult because Stanley Prison stood in the way. The engineers then thought of excavating a tunnel in order to gain access to the bay, which led to a second option—why not enlarge the tunnel into a cavern and install the treatment works inside? The cost of excavating the cavern compared favourably with that of forming a reclamation and there would be no visual impact at all. Subsequently two caverns measuring 90 metres long, 15 metres wide and 11—16 metres high were excavated to house the treatment works while a 130-metre long cavern was excavated for a service area. There is also a smaller cavern containing the disinfection area, plus interconnecting tunnels, a vertical shaft and a submarine outfall. Sewage collected from the area is directed to pumping stations located in Stanley market and various beaches, from where it is pumped to the treatment works. The plant separates sewage into solids and liquids, with the former being dewatered, pressed and sent off to landfills while the latter is passed through an aeration tank for denitrification. The settlement tanks used to reduce the amounts of suspended particles in the effluent are equipped with Lamella plates for promoting the sedimentation process—the first to be used in Hong Kong. During construction, the Island South Sewerage Scheme employed no-dig technology extensively to minimise traffic disruption. For example, sewers measuring 600-millimetres in diameter were laid by pipe-jacking inside a 2-metre diameter, 550-metre long tunnel between Deep Water Bay and Wong Chuk Hang. At the same time, old sewers were rehabilitated through the use of a special piping system called the U-liner, which again removed the need to dig up roads. 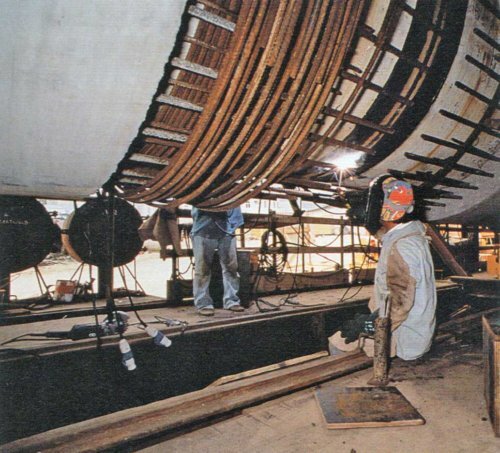 The system involved threading through existing pipes continuous lengths of U-shaped polyethylene pipes which were then inflated for a tight fit. Different parts of Hong Kong are affected by different water quality problems. In Tolo Harbour, curiously, the problem stemmed from sewage treatment works serving the rapidly growing populations of Sha Tin and Tai Po discharging nutrient-rich effluent into Tolo Harbour, causing the notorious stink. In 1986, the Tolo Harbour Action Plan was devised to solve this problem. This involved modifying the Sha Tin and Tai Po treatment works to reduce the amount of nutrient-rich effluent going into Tolo Harbour, which often led to red tides. The other part of the plan involved the construction of pumping stations in Sha Tin and Tai Po, a 6.5-kilometre submarine pipeline, a 7.5kilometre tunnel under Tate’s Cairn and other works to take the effluent out of the enclosed bay. The use of a tunnel boring machine (TBM) to excavate the 7.5-kilometre tunnel marked the first time a mechanised tunnelling method was employed on a government contract in Hong Kong. Using a TBM proved faster and cheaper than conventional drill-and-blast, saving the contractor half a year’s work on what was originally to be a 30-month project. Not only that, since a TBM causes less vibration than conventional excavation methods, the contractor was able to bore within 3.5 metres of a water supplies tunnel without giving rise to concern. The whole tunnelling contract was highly mechanised. Behind the cutter heads of the TBM trailed an erector which was supplied with 160-millimetre thick precast lining units by three trains with 14 wagons each. This construction method replaced the conventional in situ lining. The most ambitious sewage disposal scheme and the one that will bring about the greatest improvement to water quality in Hong Kong is the Strategic Sewage Disposal Scheme (SSDS). The scheme is designed to minimise environmental impact during the construction stage as well as to bring about long-term benefits. Some of the 25 kilometres of tunnels associated with the SSDS are located as deep as 150 metres below ground because designers wanted the scheme to cause as little traffic disruption as possible during construction. To avoid maintenance problems, complex hydraulic modelling has been involved in ensuring that the right velocity of flows is maintained throughout the system, to prevent the accumulation of fine particles. The SSDS employs mechanised tunnelling on a scale never before seen in Hong Kong, with tunnel boring machines being used to excavate all tunnels whose lengths justify their use. The longest tunnel to involve the deployment of a TBM is a 5.3-kilometre tunnel between To Kwa Wan and Stonecutters Island. Effluent collected by the series of deep tunnels is pumped to the Stonecutters Island sewage treatment works for chemically assisted primary treatment. Space is always at a premium in Hong Kong. Thus, the Stonecutters works is equipped to cope with a limited footprint while providing for efficient treatment. For example, conditioning sewage with ferric chloride and a polyelectrolyte to promote settlement and the use of double tray sedimentation tanks reduce the area needed for the treatment works. Just building treatment plants and laying sewage pipelines will not improve water quality if nothing is done to stop manufacturers from washing chemical waste down the drain—the disposal method of choice for 85% of it before 1993. The remaining 15%, being solids, was buried in landfills untreated. That is why the EPD decided to call upon the expertise of the private sector again, in the development of a sophisticated Chemical Waste Treatment Centre (CWTC) capable of processing 100,000 tonnes of chemical waste per year. Constructed at a cost of HK$900 million, the CWTC uses advanced environmentally friendly treatment processes which maximise the recovery and recycling of waste products. For example, the incinerator runs on waste oil recovered from the oil/water separator, while the heat it generates is used to run a unit which employs a trademarked treatment process called POWWER. The POWWER unit, in turn, reuses water condensed during the removal of brine from residues inside its evaporator for cooling the condenser. The CWTC also recovers waste material for sale. The facility’s metals recovery system recovers copper, a waste product generated in great volume through the manufacture of printed circuit boards. Recovered copper oxide is mixed with reagents to form copper sulphate, a raw material for fertilizers. Since the centre’s commissioning, more than 90% of the chemical waste generated every year is treated at the CWTC and safely disposed of. Developed by a US waste treatment company in joint venture with two Hong Kong firms, the facility has achieved significant technology transfer since its commissioning and created new career opportunities for local chemical engineers. A team of experts brought to town initially to run the CWTC has largely given way to local engineers who have been trained to take over the facility’s operation. This article was first posted on 19th July 2017. The second photo of this post with the description of “Waste Transfer Station – location unknown” possibly showing the waste transfer station at Chai Wan. The construction site behind is where now the Siu Sai Wan Sports Ground.